On this episode of The Sharpening Character Podcast we have a message from Ben for our CMOW Bible Study titled “Time and Talents”! This is a message that we feel everyone really needs to hear and apply to our lives centered around Matthew 24. Also in the Encouraging we have a second CMOW from the book of Matthew! Nick will be giving a message on “The Men That Never Followed Jesus and The Impact They Could Of Had For The Kingdom Of God”. He’ll be speaking on the rich young ruler, Peter, Judas, and more! Then we have a resource from Wes in the Equipping on a book that provides the game plan for communicating the compelling truth about Christianity with confidence and grace. In a world increasingly indifferent to Christian truth, followers of Christ need to be equipped to communicate with those who do not speak their language or accept their source of authority. Gregory Koukl demonstrates how to get in the driver’s seat, keeping any conversation moving with thoughtful, artful diplomacy. You’ll learn how to maneuver comfortably and graciously through the minefields, stop challengers in their tracks, turn the tables and—most importantly—get people thinking about Jesus. Soon, your conversations will look more like diplomacy than D-Day. 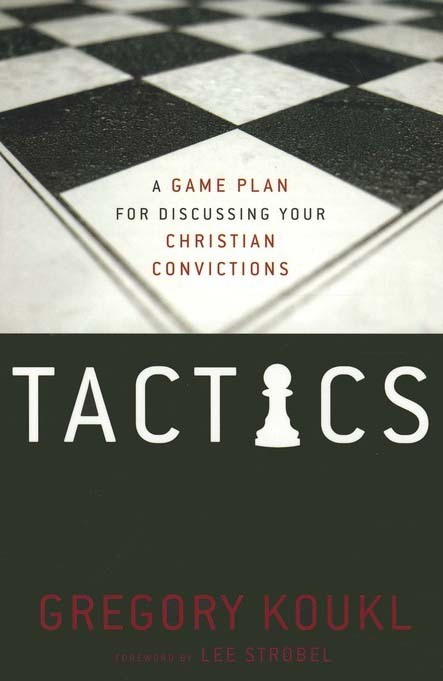 Drawing on extensive experience defending Christianity in the public square, Koukl shows you how to: – Initiate conversations effortlessly – Present the truth clearly, cleverly, and persuasively – Graciously and effectively expose faulty thinking – Skillfully manage the details of dialogue – Maintain an engaging, disarming style even under attack Tactics provides the game plan for communicating the compelling truth about Christianity with confidence and grace.